At the end of May, College des Savior students and staff visited Loyola University of Congo to learn more about composting, which is a central component of the sustainability curriculum and the Students’ Learning Garden. The group started off with a presentation from Giving Back to Africa (GBA) Project Manager Dr. Jerry Kindomba about the model of student-centered leadership and service learning used at College des Savior. The attendees were impressed with the students’ strong performance with their curricula, which they then saw in action at a hands-on composting demonstration. However, they also added to their rich knowledge base by learning more about the scientific process behind composting, like how larvae and worms assist in the composting process, and what plants make up a good batch of compost. The facilitators led a hands-on composting demonstration for the students.They enjoyed seeing students take notes and referred to them as “little scientists.” Professor Pululu, of Loyola, remarked that: “The students have impressed me positively because they have carried out an extraordinary scientific approach by first asking questions and seeing how they can bring about solutions by making a composter.” This reflects the asset-based, community-driven learning model that the students guide at College des Savior. 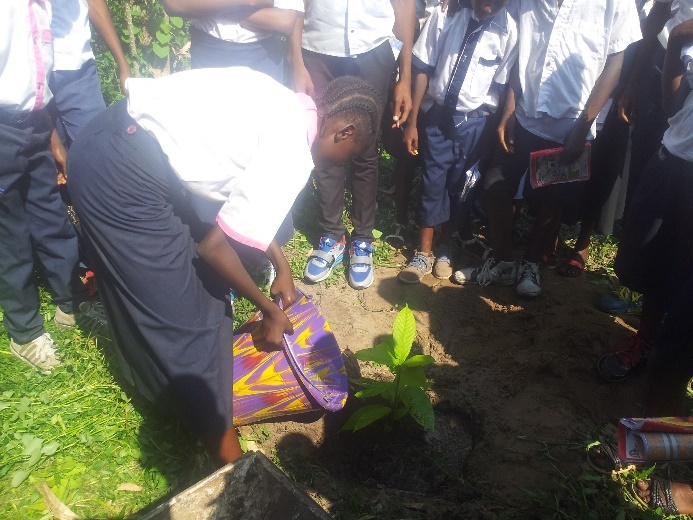 The group ended their visit by planting and tending to a cacao tree together. Both the Loyola staff and the College des Savior staff and students acknowledged that only through community support had this trip been made possible and that it was a great opportunity for future resources as the students progress with their sustainability projects. One of the Loyola facilitators even encouraged the students to try out their own composting experiments back home in small groups and offered to help set up a composter at the school after students do initial research about what makes good compost in their area. Upon their return to school, students led a presentation for fellow students who had been unable to attend the field trip and began to master their newly-learned information by teaching it to others. Teachers and staff also met with a Loyola representative the following week, beginning plans for a bright partnership between the two institutions committed to community and student-focused education.